Editor's Note: The identity of the writer is not attributed in this article, for obvious reasons. In 1960 the District of Columbia streetcar system converted routes 20, 30 and 70 to buses (the last lines to use overhead current collection). All the overhead wire came down within a week or two, but the parts of those lines with underground current collection stayed hot. This was done so cars from the remaining lines that required heavy mechanical overhaul could still travel to and from M Street shops in Georgetown. They actually turned around at 36th & Prospect Streets, a cutback on the Cabin John line. The same was true for the route to 7th St. Wharves Carhouse because it was semi-attached to the SW shops where heavy carbody work was done. The main carhouse was fenced up and full of retired streetcars. There was a terrific snowstorm one night in January, and Washington streetcars had fits with snow because of tire chains and ice clogging the 3rd rail slot. 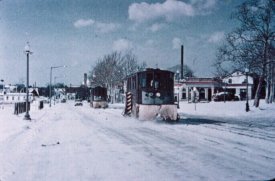 It was a great time for streetcar watching because all kinds of sweepers were out running around, and it was always entertaining to watch them hit a piece of tire chain stuck in the slot, pull a plow with a big, dramatic electric arc and sometimes derail in the process. I also noticed that on this night they had some non-revenue cars running on the abandoned lines to Georgetown and to 7th Street Wharves, among which were 766 and 0509. I'm told they used these two cars because of their greater ground clearance and heavier weight. With that as background, I was sloshing around in SW Washington at about 11PM with a camera and watching this parade of intriguing rolling stock when I noticed the darkened carhouse and decided to pay a visit and get out of the cold. I climbed the fence and found a couple of very dusty PCCs parked on the main track used for entering and leaving the carhouse. This carhouse had a single entrance/exit track with a transfer table inside. It was still bitterly cold, so I boarded the lead car and sat in the operator seat. Then I got the bright idea to power up the car and turn the heaters on. I hit the MG SET button and the car sprung to life, the compressor kicked in and air pressure started building up. I sat there contemplating the console buttons, pedals and stuff while warming up. Then it occurred to me that there was about 100 feet of empty track between me and the carhouse exit door, and I'd never driven a streetcar, and, well, with 7 years of studying motormen in action, I thought it would be a piece of cake. I released the mechanical brake with a loud clank, put the gearshift lever in the middle (forward) position, put my foot on the brake and hit the deadman pedal. Whoosh. I think it went whoosh, hard to tell with my heart pounding louder than the compressor. Then I eased on the accelerator pedal and the car moved, that is, it moved until the plow moved onto the transfer table whereupon everything died and this loud buzzer let loose. This buzzer would wake up the dead. Kinda like a klaxon on a submarine. The transfer table did not have power on the third rail. Then I got the clever idea (ha) to try and push the dead car off the transfer table with the car parked behind it. I'd seen operators pull this maneuver when they got stuck on a power cutout. So I boarded the following car, started it up and eased up on the dead car at about 1mph, but as I had no feel for the braking characteristics of a 35,000-pound streetcar, I approached the dead car too fast and KA-BAMMM! I know they heard the impact all over Washington. The panic buzzer went off and the bell started ringing by itself. Absolute bedlam. In the middle of it all, a pigeon appears out of nowhere and flies up and down the car interior banging into everthing in sight. I've never climbed a cyclone fence so fast in my life. I hit the ground and looked up and a security guard is coming at me full-tilt with a flashlight and club. I poured on the coal and he skidded in the snow and slammed into a tree when he tried to follow me around a corner. His language was quite interesting. I didn't have the nerve to laugh about the experience until 10 years later. The guard was an older, overweight gentleman who must've smoked a lot because he was doing some serious huffing and puffing during the chase. In retrospect, the pigeon in the midst of the buzzers and bells was equally funny. They'd left the car doors open and it must've been roosting on one of the seats when I disturbed its sleep.